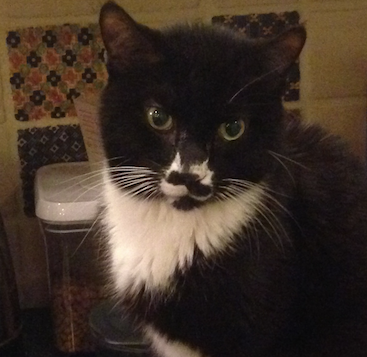 Our soulful cat Snownose died on Saturday, from cancer, but with the help of euthanasia. I've never had a cat euthanized before, though I've had many cats. The whole month before, I had to work up the courage to do this, as did other family members. I kept thinking about the conservative stance on euthanasia: that intentionally killing another person is always wrong. (If this were right, I'd extend the prohibition at least to animals who are family members.) In the days leading up to calling the euthanizer--a vet who came to our house--I kept rooting for Snownose to expire on his own. It seems like it would have been better that way. It was unfortunate for those who love him to have to play any role in his death. One thought that kept running through my mind, in the 24 hours just before the Dr. Westbrook came to our door, is that cancer had already taken away Snownose's future. When he was euthanized, he had maybe a day or two left, if that. We took away only that brief time, and only to prevent suffering. Does that even deserve to be called "killing"? Can you really be a killer, and thus responsible for a death, when a disease is already wholly responsible for the death? I'd be prepared to say "no" except what about this? Evil nurse or vet sneaks in and injects the dying patient with a poison, just for kicks. Now you want to talk about "killing" again, despite the disease being wholly responsible. And so--OK!--taking away one day of life, even out of mercy, has to be killing. Or could a case be made that "euthanizing" is a different sort of thing from killing, because of the motives involved? Is this one of those unusual cases in which motives matter to the kind of act performed? (And now I regret that I have not yet read Motive and Rightness, by my colleague and friend Steve Sverdlik.) In fact, the phrase "mercy killing" has gone out of fashion, and certainly vets don't use the "k" word. They "put down" animals (at least here in Texas), or at worst euthanize them; they don't kill them. Maybe (big maybe) the practitioners are onto something and these aren't just euphemisms. While I find your decision to end your cat's suffering ethically justifiable, rational and just plain good sense, I'd call it "mercy killing". I myself would rather err on the side of avoiding euphemisms than on that of overusing them and introducing new euphemisms into our daily vocabulary. I'm not sure whether that's an ethical or an aesthetic or a stylistic decision or all of the above. Interesting "snow" pattern on Snownose; frequent color changes like that seem relatively rare in two-toned males. It happens that I recently watched Nurse Betty, in which (spoiler alert) a person is scalped alive and subsequently flails around in desperate agony. Hearing the commotion, another guy comes into the room and immediately shoots the scalped person upon realizing what happened. It didn't occur to me for a moment that the guy who fired the shot was a murderer. The person who did the scalping was a murderer. The shooter was the good guy, at least in that scene. The difficulty with animals is that they can't tell us the level of suffering they are experiencing, apart from obvious cases of extended caterwauling and such. In the absence of obvious outward signs of considerable pain, I think I would lean toward letting nature take its course, in part because we don't really know how animals process pain. There is considerable reason to believe that humans exacerbate their own suffering by injecting their personal narratives and drama into it, whereas a cat might be all Zen about it.